Today, we have Melissa from Dilly Dabbles guest blogging and sharing some FREEBIES with you! Don't you just LOVE the name Dilly Dabbles?!? I could say it all day long! :) She has brought some great goodies for you so please be sure to pick them up and follow her over at her blog! Comment, comment, comment if you like what you see!!! Enjoy! I'm happy to be part of this fun Stuff Your Files event. I'm Melissa and I blog at Dilly Dabbles. I'm a first grade teacher recently turned instructional coach. I love to share the ideas and tips that I've learned as a classroom teacher and that I am now learning from other teachers and from coaching teachers. The ideas and items I have to share with you today are all about word work. Word work is something that I believe is important, but is also something that can be left behind when trying to fit everything else in. These few Word Wall practice activities can be done during any little bit of time you have throughout the day. They are great for when you're waiting in line for something or finished a lesson a little ahead of schedule. They are also great to do as a whole group and then place in centers for independent work. This is like that popular TV word guessing game. Go to the National Library of Virtual Manipulatives spinner online here and display it through your projector. Choose the change spinner option and replace the color names with numbers. Choose a word wall word and put line blanks on the board for the number of letters in the word. Split the class into 2-4 groups. One person from each group takes turns spinning and guessing a letter. If they get a letter, they receive the points they spun for each letter that was in the word. If the letter they guessed is not in the word, no points are awarded. Buying a vowel costs points (decide this before the game based on the number values you are using). The team that solves the word receives bonus points (again pre-determined based on the number values you are using). 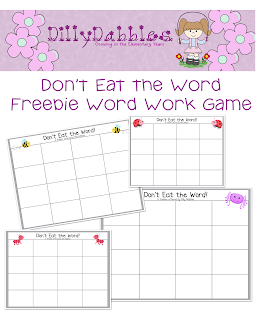 Play "Don't Eat the Word"
Print and laminate this "Don't Eat the Word" template. With an erasable marker, fill in the boxes with word wall words you want students to practice. (Students can choose their words or you can provide a list when this activity is put in a center.) To play as a class, put the board under a document camera and place a piece of candy on each square. Smarties or Skittles or M&M's work well. A child is chosen to leave the room. The class decides on the special word. The child returns to the room and begins to remove the candies one at a time. The child must say the word under the candy and if read correctly, may eat the candy. The child continues to remove the candy, say the word and eat until he/she gets to the special word. 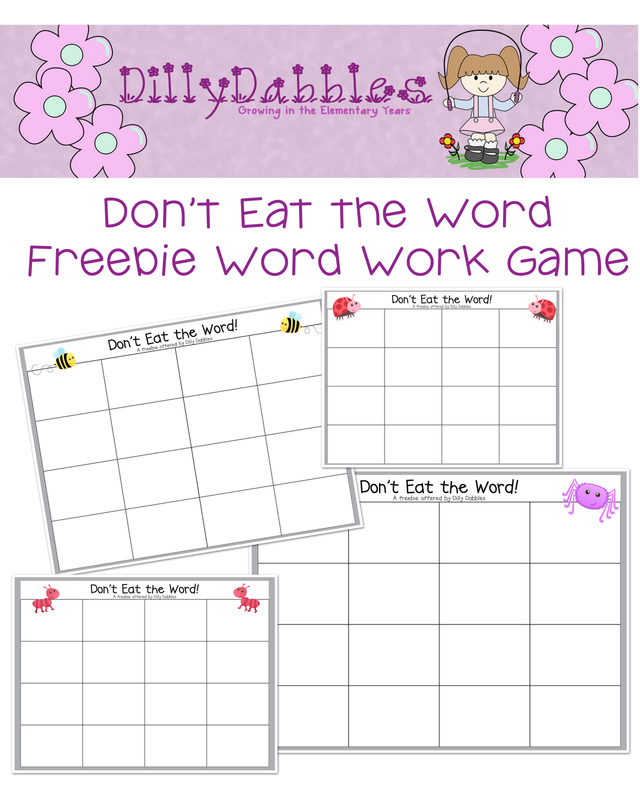 When the child reaches for the special word, the class yells "Don't Eat the Word" and the child's turn is over. Put new candy on the now empty squares and choose a new student to be "it." I'll be sharing more Word Wall ideas on my blog throughout September. Keep these two ideas at the ready to pull out at a moments notice throughout the school year. Thanks to Leanne for hosting this fun event!